Mytilene International Airport "Odysseas Elytis" (IATA: MJT, ICAO: LGMT) is the international airport of Mytilene, the capital of the Greek island Lesbos. The airport began to operate in 1948 however it was 1980 before the first charter flight landed. In December 2015 the privatisation of Mytilene International Airport and 13 other regional airports of Greece was finalised with the signing of the agreement between the Fraport AG/Copelouzos Group joint venture and the state privatisation fund. "We signed the deal today," the head of Greece's privatisation agency HRADF, Stergios Pitsiorlas, told Reuters. According to the agreement, the joint venture will operate the 14 airports (including Mytilene International Airport) for 40 years as of 11 April 2017. The airport has one small terminal that services both International and Domestic flights. 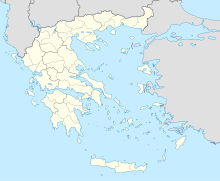 The airport is 8 kilometres from Mytilene. It was established in 1948 with an unpaved runway of 1200 meters long and 30 meters wide. Over the years the runway was paved and in 2000 the latest runway extension to 2400 meters was made. The airport has a duty-free shop, café-bar and two car rental agencies. On the northern side of the south apron Mytilene Airclub is located. On 22 March 2017, the Fraport-Greece presented its master plan for the 14 regional airports including the International Airport of Mytilene. ^ "MYTILINI AIRPORT "OD.ELYTIS"". Retrieved 9 January 2018. ^ "MYTILINI AIRPORT "OD.ELYTIS"". ypa.gr. Retrieved 17 March 2015. ^ "Astra Airlines". www.astra-airlines.gr. Retrieved 4 May 2017. ^ "LOT will make charter flights for Katowice from Rainbow Tours". ^ "Brenna – Ostrov Lesbos: Letový řád". Retrieved 10 February 2013. This page was last edited on 21 April 2019, at 19:10 (UTC).